In 1967, while I was a sophomore student in the crafts department of Philadelphia College of Art, I was asked to build a glassblowing facility. Roland Jahn, a ceramics instructor, had taken a class at University of Wisconsin, Madison, with Harvey Littleton. Roland knew enough about the studio to instruct me in the construction of a furnace, an annealing oven, a glassblower’s bench, and a marvering table. I was basically his assistant. In the fall, about October, I was privileged to be the first student to use hot glass once we had molten glass. We built the studio in a ten foot by ten foot incinerator room. The interior walls were black with a thick deposit of soot everywhere from years of burning trash. Roland knocked out some cinder blocks and installed a ventilation fan, and we cleaned out the room pretty well, but it was always black in there, and we got dirty. There were metal double doors that we would open and place a trash can or a barrel of glass cullet to keep them open, so we could lay a couple of sheets of corrugated metal across the top to create a roof above the doors. This made a kind of porch that more or less kept the rain and snow off our hot glass as we worked at the bench in the parking lot of the college. Since we had taken over the incinerator room, there was a dumpster next to the glassblowing facility. In winter the snow would fall on your piece, and maybe crack part of it, so you had to jump around a lot and rearrange the equipment to avoid the precipitation during your blowing time. Everyone had colds from being frozen on the back and roasted on the front, but we were most concerned about the exciting work as we struggled to gain some control over the glass. It was a fascinating experience, no matter how frustrating. 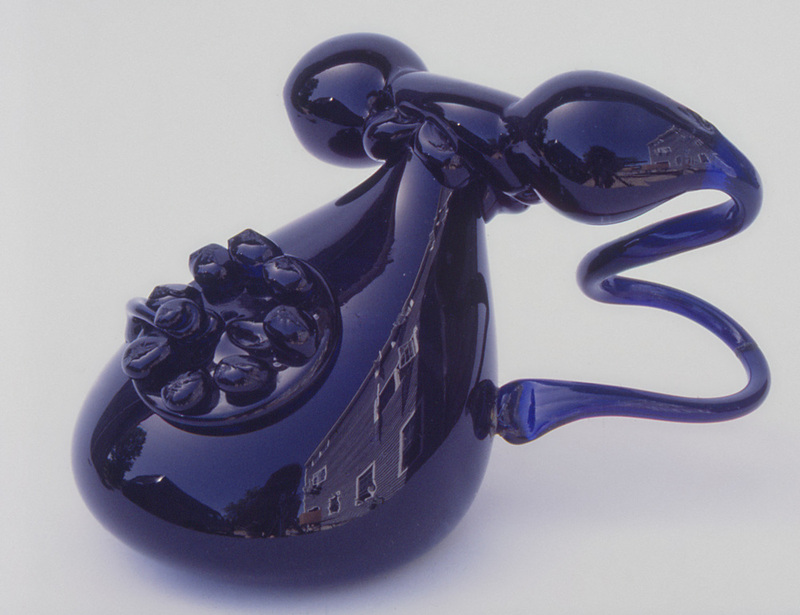 Glassblowing, and glass as a material for personal expression, put its hook into me then, and my excitement about the material has never waned. I was captured. There was no basic instruction in techniques. There were about five or six students working with glass. We practiced the ‘slop and slump’ approach to form with a bubble. Most of us were fascinated that we could work with glass that way, and there was little concern for trying to perfect our skills beyond getting something off the blowpipe and into the annealer. The prevalent art school attitude toward form in the mid sixties was organic and earthy (as much as glass can be earthy—only Tiffany or possibly Galle ever achieved that), just as it was in clay and fibers...the rough look was a rebellion against all of the highly designed products of time. You can see how Littleton, Lipofsky, Chihuly, and others who were the first artists out of the gate working with glass had a similar approach; it’s all slop and slump. Some of us didn’t buy into the look. We went to the library and found books on the history of glass, and began trying to make things that we saw in the photos. It was all experimental, and it was a fantastic experience. I graduated from PCA in 1969 with a degree in Crafts, majoring in Ceramics. I also worked a lot in metals and made a number of films, and of course I made many things in glass. The college prepared me well for many things to come. In 1970 I went to Rhode Island School of Design as a graduate student with a teaching fellowship. I had to build the glass studio there also, with a couple of undergraduate students. I was Dale Chihuly’s first MFA graduate. Then I went to Italy on a Fulbright scholarship and worked in the Venini factory on the island of Murano, in Venice, Italy. In 1973 I was asked to start a glass program at Massachusetts College of Art in Boston, so I returned to the US and built another studio at the college, with the help of my students. I just retired from Mass Art after 39 years. PCA, (UArts), gave me a solid foundation in many ways. We were all prepared thoroughly as professional artists. There was a constant demand for work, with classes starting at 8AM and ending at 6PM every day of the week. There was so much homework assigned it could never be done, even though many of us were at work past midnight many days, and a lot of us had jobs on the weekends to pay our expenses. Professional standards were expected. I remember one critique where our jewelry and metalsmithing professor held up my colleague’s metal piece and looked it over, top and bottom, front and back, and said, ”Meade, if you died tomorrow, would you want your mother to receive this as the last thing you ever made?” We had thorough instruction in processes of all kinds, and detailed demonstrations of techniques for fabrication and mold making and dozens of other ways to realize our ideas. Our conceptual goals were questioned, understood, and elicited considered response. Above all, individual expression was emphasized. I believe UArts maintains these pursuits today, and certainly deserves this extraordinary gift ensuring a strong future for the glass program. Artists today confront challenges on many levels. So much has been created over time, since the Ancient Egyptians let’s say, that it is difficult to make uniquely original work. There are a great number of artists exhibiting their work, so an artist has to be persistent, tenacious, and have luck to establish a professional career in the midst of this competition. I say luck because I think luck makes another person respond to an artist’s ideas. Yes the gimmicks and tricks of technical skills will draw a viewer to a work of art. But the soul of an idea is evident first and last, and this is what survives. You are lucky if your idea touches someone. In the 1950’s and 60’s certain artists attending art colleges and universities, thinking they might become painters or sculptors, were drawn to the traditional craft mediums. Instead of applying paint to canvas or chiseling marble they began to work with ceramics, jewelry, woodworking, glassblowing, and weaving in ways beyond the traditions of those materials. Their interests as artists led them to use the materials as modernist and abstract expressionist painters approached painting on canvas. Artists used many traditional craft materials and processes to express their thoughts and realize their visions. They were not necessarily making functional works, but they were not concerned about avoiding function either. Many used the functional format of traditional forms such as vases, chairs, necklaces, as the starting point for their concepts. Often these works do not function, yet they are inspired by functional forms. This material movement, which I call Materialism, has endured. There are college programs, material specific galleries, museum collections, complete museums; devoted to this art movement. UArts has been involved in this movement since the beginning, and is now even more engaged in the teaching of the basics and the development of professional artists with specific knowledge in these mediums. In 1987 I had a retrospective exhibition here at UArts, and that show went on to the Renwick Gallery of the Smithsonian. The catalog was designed by Joe Rapone, then head of Communications at the college, and now a professor of Design. The catalog was published by North American Publishing Company, owned by Irv Borowsky. These relationships are important and strong. The Borowsky’s involvement goes back years with the university, and their most recent generous gift will again make a significant difference in the experience a student can have. The first gift, in 1967, to begin the glass facility at PCA, came from a West Virginia Glass company and was $5,000.00. The Borowsky’s gift is one hundred times that amount, with comprehensive intentions to affect the university in positive and lasting ways. Laurie and Irv, we are all profoundly happy with your gift.